Whoever’s idea it was to put a tunnel just before the flamme rouge on this stage should never be allowed to design a course again. A crash inside the tunnel held up Marcel Kittel and Mark Cavendish (who, after giving an unexplained headbutt to a CCC rider, finished 10th) and paved the way for Team Sky’s Elia Viviani to take his first victory of the season. Sacha Modolo (Lampre-Merida) and Giacomo Nizzoli (Trek-Segafredo) rounded out the podium. Viviani takes the blue leader’s jersey and the points jersey (although Kittel has only dropped to second in both categories with no time gap between him and Viviani) and Marcin Bialoblocki (ONE Pro Cycling) takes the best young rider jersey. Another windy, sandy stage for the women. Out of the day’s breakaway, Ellen van Dijk (Boels-Dolmans) time-trialled her way to a solo victory, with Kirsten Wild (Hitec Products) and Lauretta Hanson (AusDevTeam) coming second and third respectively. Trixi Worrack (Canyon SRAM Racing) moves into the gold leader’s jersey; Wild remains in silver and Hanson wears best young rider jersey. Here, van Dijk talks about her stage victory. Sky’s Peter Kennaugh and Chris Froome gave the field something to think about with a one-two finish 17secs ahead of the chasing pack, with Dion Smith (ONE) coming in third. Kennaugh moves into the leader’s jersey and the points jersey, Froome takes the KOM and Chris Hamilton (Avanti Isowhey Sports) wears the best young rider jersey. Here’s Stage 1 action (and irreverent comments), courtesy of Orica’s Backstage Pass. 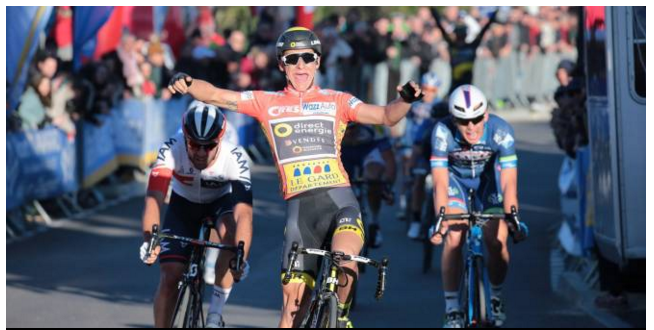 Meanwhile, back in France, it was a replay of yesterday’s stage with Bryan Coquard (Direct Energie) taking the victory, ahead of Matteo Pelucchi (IAM Cycling) and Dimitri Claeys (Wanty-Groupe Gobert). Coquard stays in the leader’s jersey. Last, but not least, we have Dan Martin (Etixx-QuickStep) coming out of the blocks strong this season with an impressive kick to take the summit finish by 2sec over Movistar’s Jesus Herrada. Sky’s Wout Poels (or Poelsy, as we decided on Twitter today) limited his losses to come in third and stay in the leader’s jersey. 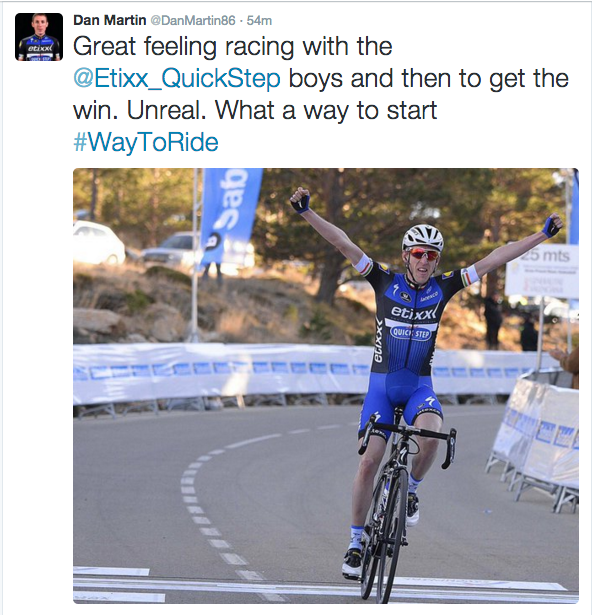 Etixx must be pleased that their new high-profile signings have both made some noise this week. Previous PostFinal KM: Dubai St1, Qatar St2, Bessages St1, Sun Tour, Valenciana St1!